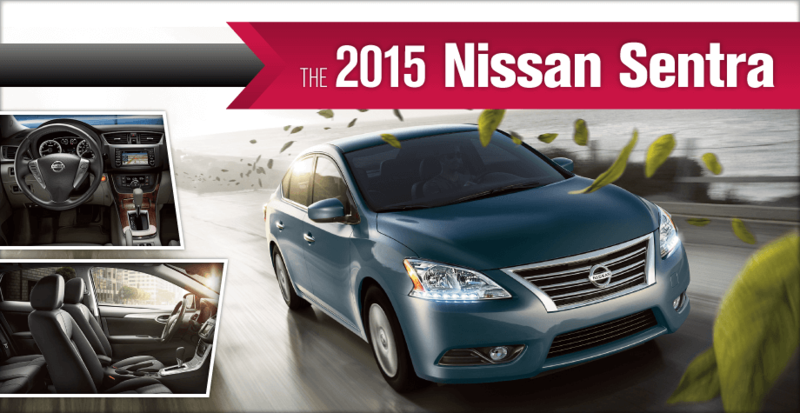 Buy or Lease a 2015 Nissan Sentra in West Haven, CT! If you have a strenuous commute or plans for far-off road trips, you and a fuel-efficient vehicle like the 2015 Nissan Sentra are a match made in heaven. With a comfortable ride, eco-friendly engine and plenty of cutting-edge tech features to keep you going, the Sentra has all you need and more. Check out all the colors and trims available at our Nissan dealership in West Haven, CT, to find your perfect fit! If you’re sick and tired of having to make routine stops at the pump, it’s time to get behind the wheel of your very own 2015 Nissan Sentra. Every model comes with a refined 1.8-liter 4-cylinder engine which, when paired with the optional Xtronic CVT, can net you as much as 40 highway mpg. It’s time to say good-bye to the pit stops and hello to adventure. And with a strong focus on safety, with features that include Nissan’s Advanced Air Bag System, Tire-Pressure Monitoring, an Anti-lock Braking System with G-sensor and much more, you can always feel comfortable inviting your loved ones along for the ride. For all those long trips and daily commutes, you’ll likely want convenience, comfort and technology to be omnipresent. Luckily, with the 2015 Sentra you get just that. With its illuminated steering-wheel-mounted controls, Integrated Key with remote keyless entry and available navigation support, traveling just got a whole lot more enjoyable. Plus, with a standard 6-way adjustable driver’s seat and 60/40 split fold-down rear seats, everyone gets the space and relaxation they desire. Add in the 5.8-inch touchscreen and power sliding glass moonroof and you’ll be well on your way to a life of luxury! Test out this stylish sedan at George Harte Nissan today and speak with our expert team about how you can go about buying or leasing your favorite 2015 Sentra!